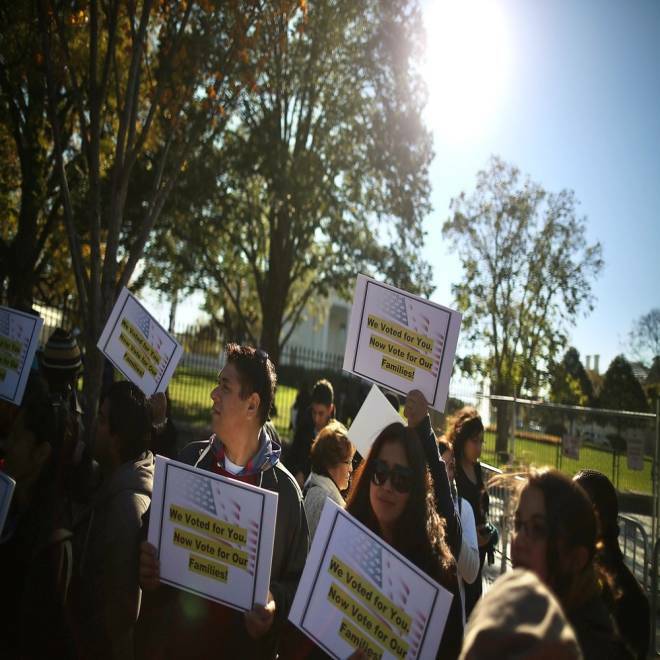 Washington is bracing for a fight in 2013 over immigration reform, a battle that could improve upon -- or threaten to exacerbate -- Republicans’ standing among Latino voters. White House and Democratic leaders have begun signaling that they might pursue the type of comprehensive immigration reform deal that has eluded President Barack Obama during his first term in office. Their renewed push coincides with a fresh round of soul-searching among Republicans after Hispanic and Latino voters, who made up 10 percent of the electorate, broke for Obama over GOP nominee Mitt Romney by a 44-point margin. An immigration reform debate next year in Congress could offer Republicans an opportunity to improve upon their 2012 performance, or further push Latino voters into the “firmly Democratic” category. 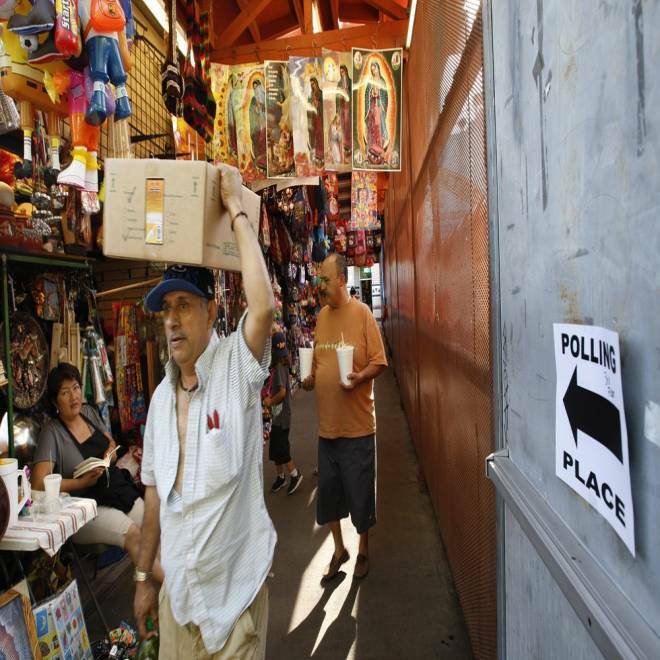 A sign points to a polling place inside El Mercado de Los Angeles, a Mexico-style marketplace in the heavily Latino East L.A. area, on Tuesday. Undergirding this inflection point for Republicans is a broader battle for the soul of the Republican Party. It pits the GOP's conservative wing, which speaks vocally against immigration reform, against leaders who urge the party to adapt for the sake of future electability. “Republicans should approach it as the party of Reagan and Bush -- the party that has historically been pro-immigration,” said Grover Norquist, the anti-tax activist who is also spearheading an effort to sway fellow Republicans toward embracing immigration reform. “We’re up against a president who introduced nothing legislatively. The idea that Obama and Democrats are good on this is all optics and no reality,” he said. The party is a far cry from the days of George W. Bush's presidency, when he urged Congress to pass an immigration reform bill that offered undocumented immigrants a pathway to citizenship. Republican leaders like Arizona Sen. John McCain were vocal proponents of those sorts of reforms, but the party has drifted rightward since conservatives balked at Bush’s 2007 immigration push -- and it has bled Latino voters ever since. “The best thing about Republicans losing is that it will likely force them to cut an immigration deal,” said former Bush aide Mark McKinnon. McCain, one of the party’s centrist figures on immigration, cut an ad during his 2010 re-election campaign urging the government to “build the danged fence” -- that is, a fence sealing the border between the United States and Mexico. NBC's Tamron Hall breaks down the results of the NBC News national exit poll, which shows a gender gap that worked in President Obama's favor as well as a boost from the Latino community, from which he received more votes than four years ago. Republican senators who had supported the DREAM Act -- a piece of legislation offering a pathway to citizenship for children brought to the U.S. illegally -- withdrew their support and voted against the proposal in the last lame-duck Congress, fearing the backlash of the Tea Party at its apex of power. Republican Arizona Gov. Jan Brewer spearheaded one of the most far-reaching immigration laws in the country, which allowed law enforcement officials to ask anyone whom they suspected of illegally being in the United States for proof of their residence. The party’s shift was even more vividly illustrated during the 2012 Republican presidential primary. In that race, Mitt Romney positioned himself to the right of his opponents, going so far as to characterize his policy as favoring “self-deportation” by making life in the United States so difficult for undocumented immigrants that they would voluntarily choose to leave. “Should I win a second term, a big reason I will win a second term is because the Republican nominee and the Republican Party have so alienated the fastest-growing demographic group in the country, the Latino community,” Obama told the editors of the Des Moines Register in October, adding that it would facilitate a “deep interest” in the GOP to get immigration reform done. The political timing for Democrats is ripe, and they have sent every signal in the aftermath of the election that they intend to seize the moment. Texas Congressman-elect Joaquin Castro joins NBC's Andrea Mitchell to discuss his election, immigration reform and minorities in Congress. Vice President Joe Biden told reporters on Wednesday that he was “very optimistic” about the prospects for immigration reform because the election had served as a “wake-up call” for his GOP colleagues. Senate Majority Leader Harry Reid, D-Nev., said Wednesday as well that the Senate should expect to vote on immigration reform this year. Latinos and immigrants rallied in front of the White House on Thursday, calling on President Obama to fulfill his promise of passing comprehensive immigration reform. Democrats’ biggest ally in gathering Republican support, might be the specter of further Republican marginalization among Latinos. “As a 14-year elected Republican official, I have to say that I'm very concerned about the Republican Party -- not that I didn't see it coming,” Republican Utah Attorney General Mark Shurtleff said on a conference call Thursday to address immigration. He called on his fellow Republicans to reject the “extreme right,” and move forward with some kind of immigration reform. Norquist said he believes Republicans in Congress can be swayed toward immigration reform -- and even seize the initiative on it -- within a year. Pence in as governor of Indiana; Hassan wins in N.H.